From 20 km, I finally saw the monolith, Uluru (Ayers Rock), that for years had been at the top of “The List,” of things I have wanted to see or do ever since I saw a wolf on Isle Royale, six and a half years previously. The day after we flew in, we took a sunrise tour, where we saw the low rays of the Sun, in a few days to be briefly eclipsed by the Moon, strike the sandstone. Then we approached it. Uluru has been around for 350 million years. What we see is the tip of a large uplifting, with rock extending about 2 km below the surface. I didn’t know that, and that was only the beginning of discovering what I did not know. For example, we visited numerous caves and inlets to the rock. Uluru is not simply a rock with vertical faces; there are many places where water can collect, places where people can–and have–hidden, lived, and practiced their faith. The aborigines, who were once shot on sight by the first white men on the continent, have been present in this area for 60,000 years. That is roughly thirty times the existence of any other major religion on the Earth. To them, Uluru is sacred. There are places along the trail where one is not allowed to photograph, just as it is considered insulting and wrong to photograph an aborigine without their permission. The visitor’s center is off limits to photography as well. 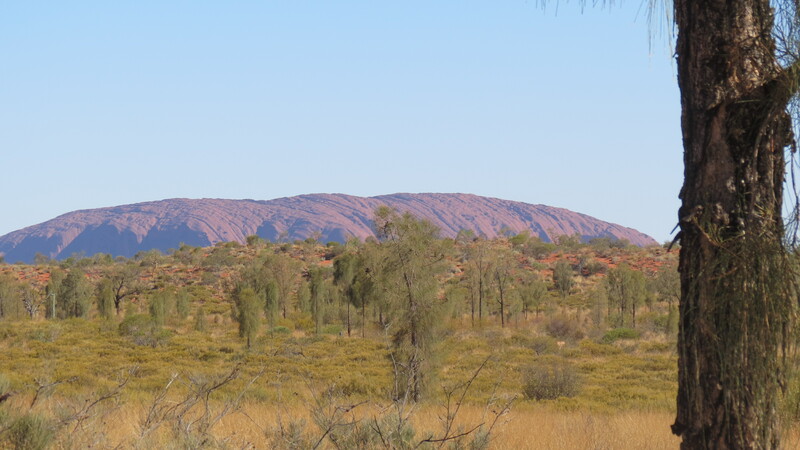 As one leaves the visitor’s center, there is a request–not a requirement, since there are no requirements at Uluru, only requests–not to climb what is considered sacred to the aborigine people, who never climb the rock. There is a chain that allows people to climb the monolith, but the day I was there, the rock was closed because of high winds. 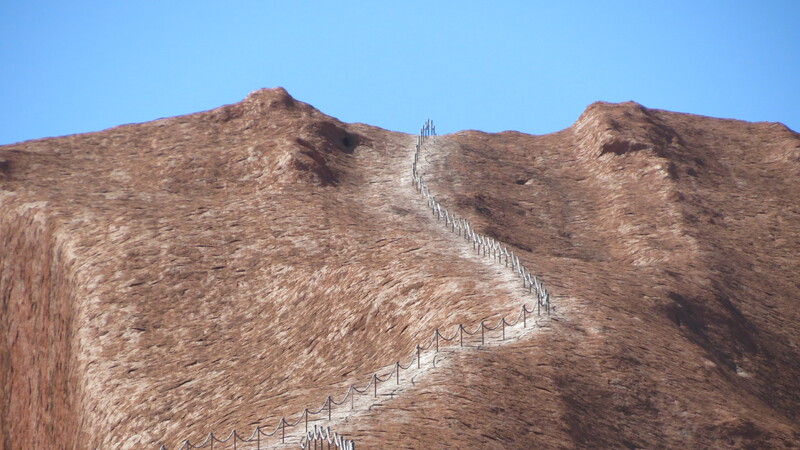 It didn’t matter to me, since I had not planned to climb it anyway, knowing it was sacred and ought not to be climbed. 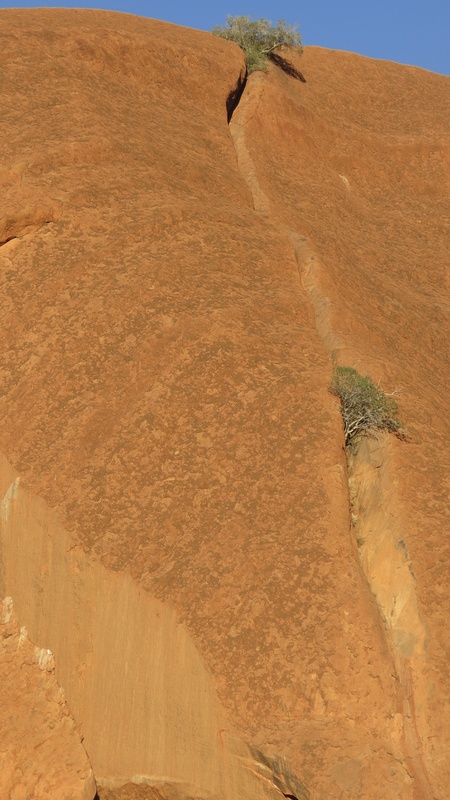 Thirty-six people have died on Uluru from climbing, and for each the natives have required a ceremony to help those who died into the afterlife. There are several memorial plaques that were placed on Uluru as well, although there are no new ones, because that affects the monolith, too. Frankly, I found it good to go to a place where there were no extreme sports allowed. 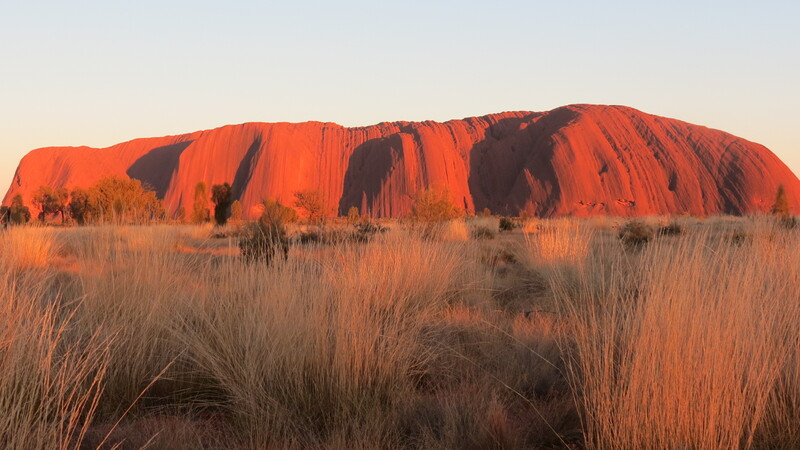 There were no races up Uluru, no helicopter rides or hot air balloon rides to the top. Indeed, the airspace over Uluru is also off limits. There were no people BASE jumping, or using other conveniences to fly off the mountain. 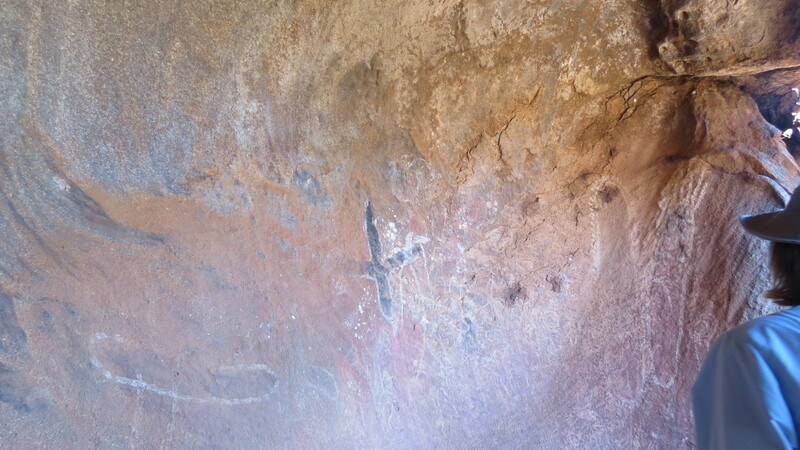 Other than the chain fence, and the worn path into the Sandstone, there were no marks on Uluru other than a few paintings in the lower caves. I can only imagine what Uluru would be if left to the white people. There would be multiple routes to the top, the sandstone would be pockmarked with pitons, there would be ropes hanging off it, old campfires, tents, mountain biking, tours to the top, marathons ending at the top, races around the monolith, human waste and other litter. I don’t have a problem with any of the above races, so long as they take place where it is appropriate, not one sacred to people who have existed in an incredibly harsh environment for sixty thousand years and have not destroyed it. Theodore Roosevelt once said about the Grand Canyon, “You cannot improve on it. Leave it as it is.” We have not done that. South Rim Village is large, although it is a relatively small area on the Rim. There are trails, although they are limited as well, and they require a great deal of effort to walk. We have, however, filled the airspace with fixed and rotary wing aircraft, creating a great deal of unnecessary noise. 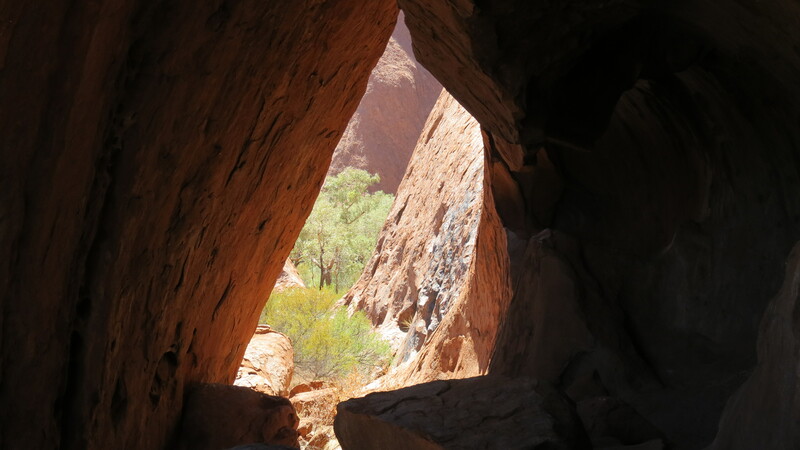 By Uluru, one hears the wind, the birds, and very little else. That evening, we took a sunset tour, again watching the change of colors that were a function of the Sun, the sandstone, the caves, and the black stripes where water drained off the monolith with each rain. It was spectacular. A group of Austrian tourists were nearby, and I practiced my German with them. I lent them my binoculars so they could see parts of the monolith that I now knew something about. It was the first time I had taught about nature while speaking only German. I explained the pools along the rock that collected water and then overflowed to pools below. I found words that I knew as I needed them. It wasn’t great, but they understood what I was saying. In two roles that I was comfortable in, teaching and nature, I was able to relax and speak. It made the view even more magical. How many different languages had been spoken at this site during the past six hundred centuries, I cannot imagine. But one man spoke two that night, and for him, and that was special. It’s nice for once to see something truly unique, virtually unspoiled, and will stay that way, except for the path to the top, which may some day be closed. I hope it will be. 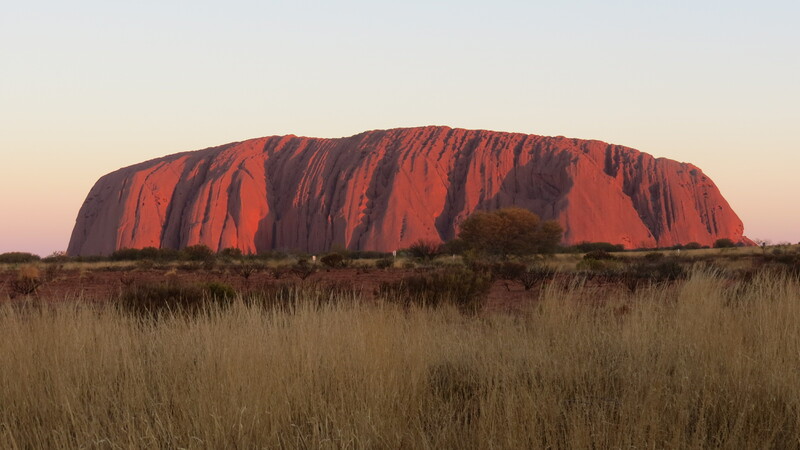 I went to Uluru to see the largest monolith in the world. I came away thinking how nice it was that Australians, most specifically the most maligned ones–the aborigines–have not allowed the large numbers of people who have to show they are the best at whatever sport they decide they must do. 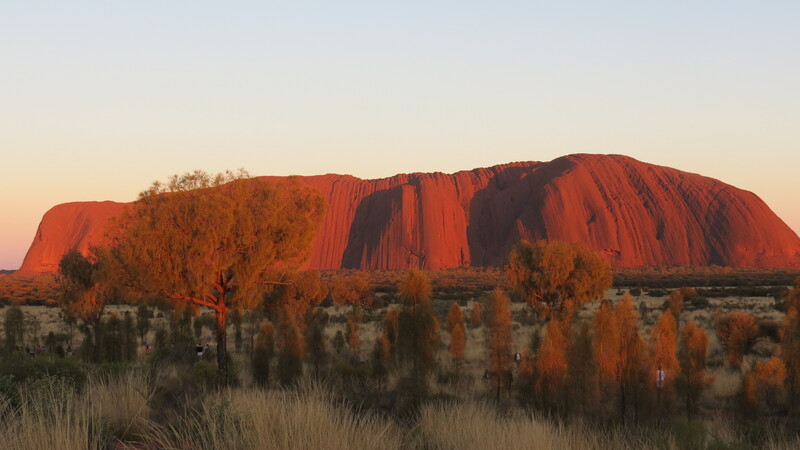 World class is to me an overused term, but at Uluru, the term is deeply appropriate. This entry was posted on November 19, 2012 at 09:11 and is filed under ECLIPSE TRIPS, UNPUBLISHED OUTDOOR WRITING. You can follow any responses to this entry through the RSS 2.0 feed. You can leave a response, or trackback from your own site. Hi, Mike, I loved the pictures!!! Spectacular trip!